Great literature has the power to show us to ourselves, to give insight into the sort of person we are and might become. This is not a new thought, but it always has surprising implications. You might think of great literature as the product of a bygone age and not all that popular: the timeless—but also endless novels—of Victor Hugo, Leo Tolstoy, and Charles Dickens, or the concise social anatomies of Jane Austen. Books that we read once in school and, unless you are a scholar or a true aficionado, no one willingly reads today. But now I am also thinking of a modern work of fantasy that has the same power to evoke particular characters and personal allegiance. J.R.R. Tolkien’s The Lord of the Rings is full of characters that strike a chord in the reader’s heart at the many stages in life. A young person faced with a challenging task for which he or she has the courage but may doubt they have the strength will find a resemblance in the intentionally androgynous face of Frodo Baggins. A loyal friend or supportive spouse who would pick up a loved one’s burden if only he or she were asked will feel a kinship to the servant and companion Samwise Gamgee. And the cast extends beyond those main characters. Who has not felt like a true king in hiding, with the skills and a destiny beyond his or her current occupation, like Arathorn? And who has not felt that her or his heart and soul were placed into the wrong body and the wrong social situation, like the shieldmaiden Éowyn? Every grandmother can see in herself Galadriel, still beautiful after all these years and with gifts and wisdom to bestow and a mirror with which to show the young all that might yet come to pass. And any grandfather can see in himself Gandalf, still strong and vigorous despite great age, but with more answers now, and finally starting to put together the great puzzle of his life. What wide-eyed, impulsive child doesn’t share a bit of the reckless exuberance of Merry and Pippin? And what criminal or thug doesn’t share a glint of Saruman or a sliver of orc? Tom is the ageless man, “oldest and fatherless”—perhaps the oldest being in Middle Earth. He has made his home in the Old Forest for centuries of solitude. He lives with an ageless, ever-beautiful young woman.2 He sings to trees3 and decorates his home with flowers.4 He fears nothing that is evil or dead, and he is untouched by the One Ring of power. Tom Bombadil lives as a hermit in the modern world, holding at a distance the cares and worries of everyday life, and is never to be trusted with weighty matters such as deep decisions of policy and the politics of power, because he is inner-directed to the point of distraction and perhaps a kind of autism. The part of Bombadil’s character that is important to Tolkien’s story is how he reacts to the One Ring, which contains a great measure of Sauron’s personal, magical powers. 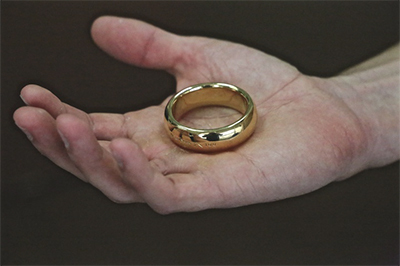 Others in the story such as Bilbo, Frodo, and first of all Gollum want the ring because it is beautiful and attracts their lust for possession. The more seasoned minds of Gandalf and Galadriel are drawn to it for the power it contains and the good they might do with it, but they also fear it for the way it will warp their will and intentions. But Bombadil alone can pick it up, hold it, admire its beauty, and even put it on—then give it back. The beauty of the metal thing itself cannot match the beauty of the life he already leads. And the power it offers can in no way enhance that life. At one point in the story, when the Council of Elrond is debating what to do with the One Ring, now that it has come into their possession, it is suggested that they give it to Tom Bombadil for safekeeping. But that is no solution, because he does not understand the hold the ring has on others. He would be like a child asked to keep the Hope Diamond. He might hold it for a while, then forget it, misplace or lose it, or even give it away in a moment of generosity. And unspoken is the question of how durable his personal strength and determination to preserve it might be when the minions of the Dark Lord discover where the ring is kept and come after it. Tom Bombadil is in this world, but not of this world. And that is both a strength and a weakness. Several times during my career as an editor and writer I have been offered and accepted positions as a supervisor and manager. Most recently, after several stints as a director on my condominium association board, I was elected president. Each time, I had projects I wanted to complete and situations I wanted to set right. But the impulse never lasted, and subsequently I resigned and walked away. It was not that I don’t understand the function of leadership and the uses of personal power,5 but wielding it holds no attraction for me. I lack the gene or the nerve synapse that makes someone want to tell other people what to do. If asked or if the need arises, I will give advice or make suggestions, but to speak from a position of authority, to command obedience because of a position and the rules or laws or customs that back it up—that is foreign to me. In my view, all exchanges between adult humans are personal, based on trust and respect, and not subject to coercion. I know myself now, and I work best alone. In this, I am like most other artists: striving for a vision that is personal and not subordinate to the insights, directives, or unhelpful efforts of the people around me. Yes, in my work for various corporations I have written articles and posters that carried the company message. But that was always after I had reconciled myself and my vision to the corporation’s culture and its aims. For the period that I worked in the company and took their money, I adopted their goals. But I still maintained enough artistic and professional integrity that, when someone up the chain of command wanted to force a message or a directive that would deflect or do damage to those goals, I would politely but firmly refuse, and always with a respectful explanation of why not. Tom Bombadil had his own power to make things grow and become beautiful—and make growing things heed his voice and obey the intention of his songs—but that power could not be shared with others or made to serve a purpose that Bombadil himself did not understand. So I have the power to convert thoughts into coherent words, arguments,6 and stories. But I can’t easily share that power with others. I can accept their edits, especially when the changes are backed up with the persuasion of a paycheck. But I can’t easily collaborate on a text that will have some of my thoughts mixed with the thoughts and words from another mind.7 The artistic vision is not easily shared. Similarly, I once tried to write a book that would capture the market share staked out by some popular bestsellers of the time. Many agents and editors will tell young writers that their work would sell if only they could write like author X or tell a story similar to bestseller Y. My one attempt to school my vision to the thriller market was Trojan Horse, which went absolutely nowhere. Of course, the trap in trying to follow bestsellers in the marketplace is that they already have their audience. By the time a new writer gets the idea, creates a manuscript, finds an agent or a publisher, and then the work goes through the production and marketing effort, the public taste and perception will have moved on to something else that’s new. So it’s better to just do what you can do well and hope that lightning might strike. The most important aspect of Tom Bombadil’s character is that, although the rest of the world sees him as a private soul, closeted to the point of invisibility, and doesn’t trust him more than it would a child—he is happy. His life is complete. He expects nothing that he cannot obtain for himself. And that is not a bad way to live. 2. Mine was with me for 41 years—a long time in modern reckoning—and she was never less than beautiful in my eyes. 3. My main occupation, if you count telling stories and writing them down on sheets of paper. The paper has more recently became a complicated engine of electronics and glowing phosphors that records my thoughts. 4. True, if you count shelves full of books as the flowering of other human minds than my own. 5. In fact, for a year or so at the public utility I wrote and edited a newsletter for managers and supervisors that taught the principles of leadership. I defined the role of leader as achieving goals through the cooperation of others. For this newsletter, I had to do a lot of reading and thinking on the subject. But my own goals are small and personal, best achieved by the one person I can command with impunity: myself. 6. Here “argument” is used in its older sense: not an altercation between two hotheads, but the chain of reasoning offered in support of a proposition. 7. Yes, I collaborated on four novels for Baen Books, as listed here under Science Fiction. But these were situations where the publisher had previously acquired an outline or notes toward a novel from a senior, established writer who had no intention of following up on them. It was then my task to absorb the idea—make it part of my artistic vision—and produce a manuscript that the senior writer could then edit and agree to put under his name and mine. It was purely a means of getting my own name more widely known in the marketplace.